Melioidosis, A Stubborn, Potentially Deadly Infection, Gets Attention : Goats and Soda It causes melioidosis, whose yearly death toll of 90,000 is about the same as for measles. But the disease hasn't been on the global health radar — until now. 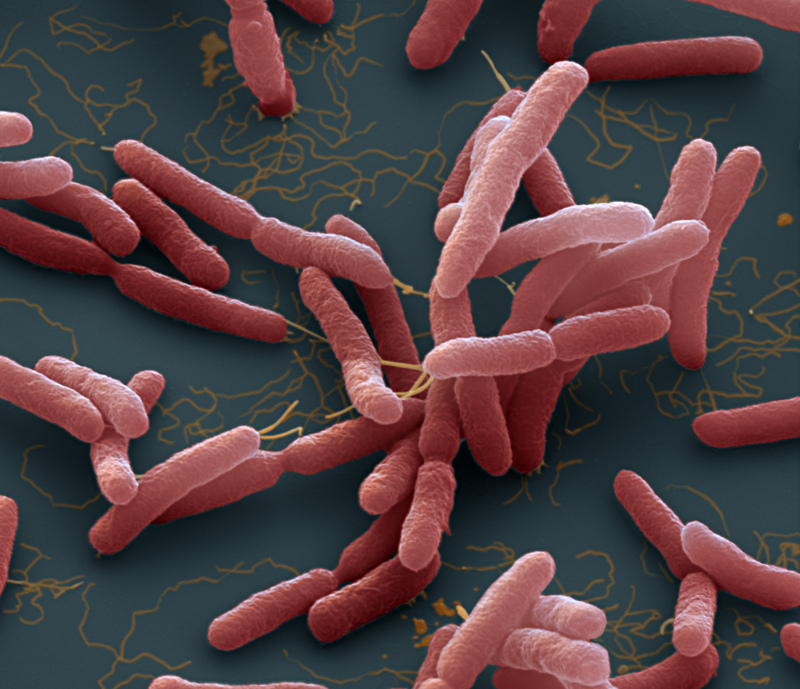 A colored enhanced scanning electron micrograph of Burkholderia pseudomallei. These motile bacteria are the cause of melioidosis, a tropical disease spread through contaminated water and soil. The bacteria can infect the skin, causing inflammation and muscle aches, or the lungs, causing chest pain, cough and in some cases pneumonia. Melioidosis is a disease that strikes fear in those who've heard of it. Doctors in Southeast Asia and Northern Australia know it as a stubborn, potentially deadly infection that causes pneumonia, abscesses and, in the most severe cases, organ failure. Without treatment, it can kill within 48 hours. Military officials worry it could be converted into an agent of terror. But for decades, melioidosis seems to have lurked under the radar of global public health organizations. "For everybody, it was a disease of southeastern Asia and Australia," says Dr. Eric Bertherat of the World Health Organization. "But we are discovering that this disease is present in many other regions worldwide." A new study published Monday in Nature Microbiology says the bacterium causing melioidosis, Burkholderia pseudomallei, is living in the soil and water of 45 countries and is likely spread throughout another 34 countries, all wrapped around the tropics. "[The work] demonstrates the potential burden of this disease is much bigger than what everybody expected: 165,000 cases a year," Bertherat says. "It's a big burden, equivalent to rabies, and that's a severe disease." And the death rate can be high — "up to 70 percent," says Bertherat. The study estimates there are about 90,000 deaths each year from melioidosis, roughly the same as measles and several times that of dengue. For doctors in areas where the disease has long been common, the numbers are a grim confirmation of old suspicions. "For us, we think it's a reasonable number. In northeast Thailand, I see two to three patients die of this during the rainy season every day," says Dr. Direk Limmathurotsakul, a microbiologist with the University of Oxford and Mahidol University in Bangkok and lead author on the study. "When I went to Indonesia, every lab we looked, we found this disease. We feel this is a minimum number." The disease has probably been killing people in these countries for years, but it's often missed, says Dr. Bart Currie, a microbiologist at Menzies School of Health Research in Australia who did not work on the study. Because the symptoms are so nonspecific — abscesses and fever and sepsis can all occur in other bacterial infections — melioidosis earned the moniker "the great mimicker." "This very potentially dangerous bacterium is even harder to diagnose than the standard bacterium," Currie says. Misdiagnosis is a common problem in areas where the disease is not well-known — and can be fatal, says Limmathurotsakul. "It's worrying for areas outside of our research center [in northeastern Thailand]. And we know that's happening in many emerging areas — like India, Brazil, Indonesia," he says. B. pseudomallei is naturally resistant to many commonly prescribed antibiotics. With good supporting care and access to proper medications, fatalities drop to around 1 in 10, and most healthy adults are able to survive an infection with good care. Otherwise, death sets in quickly. "There are many who have been treated with ineffective antibiotics for a period," says Limmathurotsakul. But by the time the disease is confirmed as melioidosis, he notes, "most of the time, the patient has already passed away." B. pseudomallei rarely spreads from person to person, but in some parts of the world it is extraordinarily ubiquitous. In parts of northeast Thailand, up to half of the population has been infected at some point, Currie says, and carry antibodies to the bacterium in their blood. Scientists believe the bacteria colonize the roots of certain plants and can feed off amoeba, though its natural history isn't well-known. Limmathurotsakul's model confines the bacteria's range to the soil and water of warm, wet climates generally within the tropics. And B. pseudomallei is a tough thing. In 1993, Thai scientists mixed B. pseudomallei with pure, distilled water. Each year, for at least 16 years, Limmathurotsakul says, they tested the water and found the bacteria had survived without anything to sustain them. This organism's hardiness and deadliness have earned it some infamy. "In the United States, the disease has primarily been studied as a bioterrorism agent," says Dr. Donald Woods, who studied B. pseudomallei for decades as a microbiologist at the University of Calgary and was not involved with the study. The U.S. government funds research on how to prevent or treat B. pseudomallei in several labs around the country. Although, the Centers for Disease Control and Prevention shut down studies on the bacterium at Tulane University National Primate Research Center last year after the bacteria breached containment and infected two non-human primates. Limmathurotsakul's model predicts the bacteria could survive in southern Louisiana's hot, wet terrain, but so far soil and water samples have turned up clean. Woods says B. pseudomallei would most likely be weaponized by an aerial route. "The organism is much more dangerous when inhaled. The lethal dose drops dramatically if given by an aerosol route. So there are real concerns about bioterrorism use by an aerosol use," Woods says. A close relative of the bacterium, B. mallei or glanders, was used in World War I and II originally to injure and kill horses and mules — and some human handlers fell ill as well. The name melioidosis — "melis" means "a distemper of asses" in Greek — refers to the bacteria's ability to infect animals. Later in the century, B. mallei and B. pseudomallei were considered for bioweapons programs by the United States and likely the Soviet Union. But thus far, melioidosis has not been weaponized. The most common way to get infected is likely when a cut or scrape comes into contact with contaminated soil or water. Others might breathe the bacteria if exposed to typhoons and violent weather events that whip up dust and water. That makes the advice to avoid melioidosis simple, Limmathurotsakul says: Stay indoors during storms, and wear protective boots and gloves when working in fields. But the lack of awareness has been maddening. "We should stop patients from getting the disease from the start. It could be done," he says. "But it's not at all in the public health campaign. People still go into rice fields without protective gear and unaware they're putting themselves at risk."